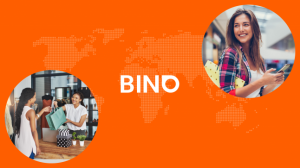 BINO - crowdsourcing platform for SMB. It allows you to measure customer experience with the help of mystery shopper visits in 100% self-service mode. It’s simple: shopper recruitment, training, scheduling, data validation and payments are fully automated. Start your project in 20 minutes and get the first report today! We started sales in Russia in August 2017. In October BINO has $1200 in revenue (+267% month to month), about 100 clients and 2000 shoppers. We have a strong team, product, and clear strategy. In November BINO starts in NY. Our primary target market is the companies that already use mystery shopping or merchandising audits. Its size is about $1.5B in the US and $4B globally. A secondary market is the companies that don`t know what is mystery shopping (basically small business). We plan to get 5% of the primary target US market in next 2 years and start sales in Asia & Middle East in 2018. Crowdsourcing market consists of agencies and old-school services. And this is a problem because agencies are the middle layer. They are expensive, slow and finally, it's not easy to find the suitable agency. Especcially for a small company. BINO allows you to order instore-audits in 100% self-service mode. It’s simple: shopper recruitment, training, scheduling, data validation and payments are fully automated. Start your project in 10 minutes and get the first report tomorrow! A. Mystery shopping agencies (SecretShopper, Coyle, BARE). They are expensive but they deliver strong customer service. B. Direct competitors (Field Agent, iSecretShopper, Presto InstaShops). They have self-service mode & small price per visit. But use manual labor. C. Crowdsourcing services (Mobee, Gigwalk). They have strong mobile platforms. But don`t have a full self-service mode. A. MS agencies. BINO 2 times cheaper, you can start the project in 10 minutes, you can control all processes. B. Direct competitors. BINO only the one has 100% self-service mode. We have automatic scheduling & quality control of the data based on AI. C. Crowdsourcing platforms. BINO focused on mystery shopping. It means that you can use complex questionnaires, scenarios & collect audio/video files. And we have a self-service mode. We have invested own fund in November 2016 ($200K). In February 2017 we raised $130K from Starta Accelerator (NY). Our seed is $700K and 500 of them we have already get. BINO has two subscription plans. B. Over 50 visits monthly - $6 per visit. We are looking for $200.000 for 5%. We usually make out a deal via SAFE. February-May 2017. Starta Accelerator, New York. BINO was selected from 400 startups and finished on the 2nd place in the batch.